A photo went viral last week after causing quite a stir in the IVF community. 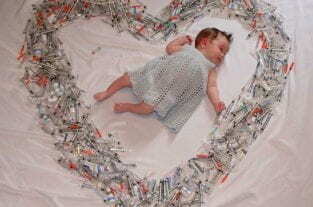 The beautiful photograph shows an adorable baby girl sleeping within a love heart made of syringes. The syringes represent those used by her mother during the 18 months of IVF treatments it took to conceive her daughter. The heartwarming image was shared by Sher Institutes on their Facebook page, and was credited to one of their former patients, Angela. Speaking to ABC News, the baby’s mother explained, “The needles were the easy part. It was the emotional struggle, the ups and downs, that really took a toll,” she said to ABC News. The image has been shared thousands of times, made news across the world and, most importantly, encouraged others to share their IVF journeys. Commenters from all over the world shared photographs of their children conceived through IVF, and others offered words of encouragement to those still on their journey. The photograph doesn’t even contain all of the syringes used during the 18 months of IVF cycles, showing just how much work is involved in having IVF. It can be a long and stressful journey, and one certainly filled with ups and downs. Though the use of IVF is becoming more common, it’s still not something you hear about all that often. Though people may tell you they used IVF, it’s rare for them to share the details of that difficult journey. This photograph not only highlighted the struggle many couples face, it also gave them a place to share their journeys and receive support. It’s also a gorgeous keepsake for the mama, allowing her to honor and celebrate the time and effort that went into having her daughter. IVF isn’t easy, and success stories definitely deserve to be celebrated. Want to know more about IVF? Find out how it works by watching this awesome video. Please consider changing your heading on this article – it is so misleading!! This photo doesn’t “perfectly capture the IVF journey” !! For many there is no baby at the end of IVF. There are no guarantees and you are misleading women into thinking there are. I love this article (and the title, BTW). Even though I was familiar with IVF, and my perception of it was months and months of injections, I really didn’t appreciate the juxtaposition of pain and love that I am experiencing in the process. This photo captures that perfectly. I am looking forward to the time when I get to show off my beautiful baby…what makes this all worthwhile…much love to all who are experiencing or have experienced this journey!